The Economic and Financial Crimes Commission, EFCC, yesterday re-arraigned a close associate of a former Petroleum Minister, Diezani Alison-Madueke, Jide Omokore, and others on nine counts of criminal diversion of about $1.6bn alleged to be part of proceeds of the sales of petroleum products belonging to the Federal Government. 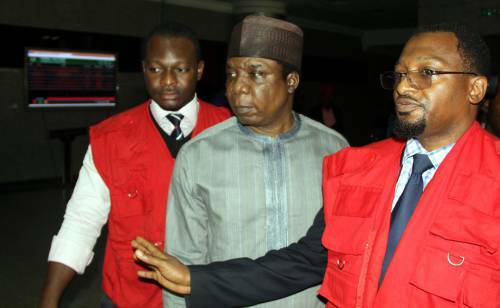 Omokore was re-arraigned before Justice Nnamdi Dimgba alongside Victor Briggs, Abiye Membere, and David Mbanefo. Two of Omokore’s companies, Atlantic Energy Brass Development Limited and Atlantic Energy Drilling Concepts Limited, were also part of the accused persons. Part of the offences were said to be contrary to section 1 (1) (b) of the Advance Fee Fraud and Other Fraud Related Offences Act and punishable under section 1(3) of the same Act. The accused persons were earlier arraigned in June, 2016 before Justice Binta Nyako. The case had to start afresh following its transfer to Justice Dimgba. All the accused persons pleaded not guilty when the charges were read to them again on Monday. After the arraignment on Monday, the prosecuting counsel, Mr. Rotimi Jacobs (SAN), urged the court to allow the defendants to enjoy the bail earlier granted them by Justice Binta Nyako. He also urged the court to fix a date for the commencement of trial. The defence team did not oppose Jacobs’ applications. Justice Dimgba agreed and fixed December 8, 2016 for trial.